The Industrial Relations Fixed-term Supply is provided by phone and email and is for a 3 month period. The series of questions below this description is a generic sample of the question format that we use with you in the supply period. 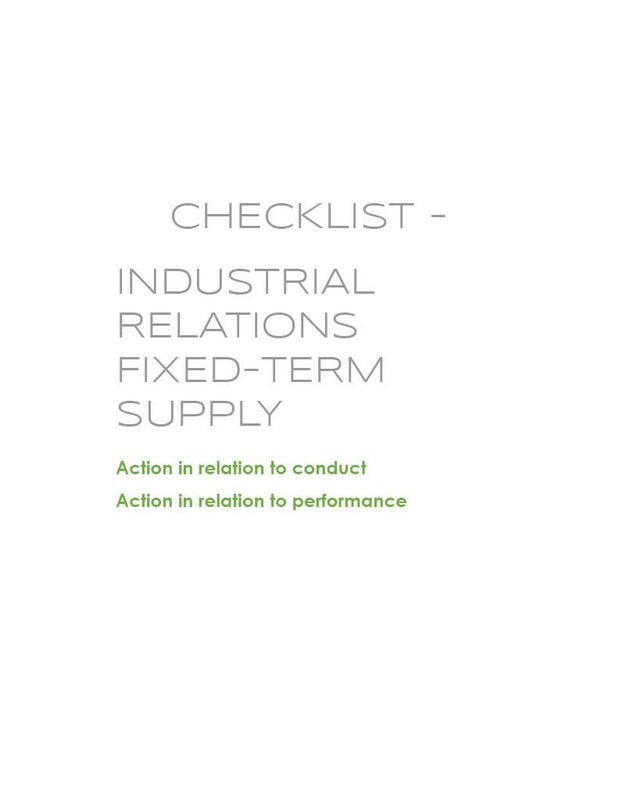 In the period, we address questions specific to your matter, which, together with their answers, can be used in your communications in your industrial relations matter. The volume of questions that we address in the period, with specific regard to the details we receive from you on your industrial relations matter, is the volume in the generic sample below, although the actual industrial relations questions in your case may be different. When you purchase the Fixed-term Supply, please tell us your contact details and nominate a start date for the 3 month Fixed-term Supply, so that we can schedule the period, receive your communications, and begin to craft relevant questions as soon as possible. The most important materials that we use in addressing questions specific to your matter are case decisions of Australian industrial relations tribunals. Industrial relations means the relations between management and workers in industry, and includes actions regarding pay, other terms and conditions of work, job performance, and conduct at work. 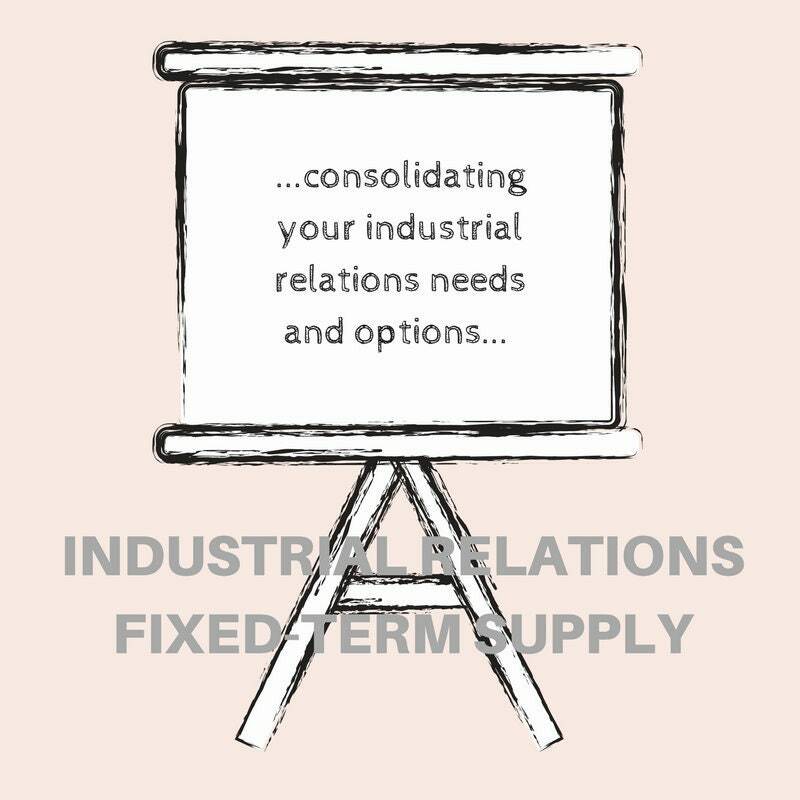 We provide industrial relations services, such as the Industrial Relations Fixed-term Supply, to meet demand for affordable and tangible tools that anyone can use, under their own steam, in responding to workplace issues. Prior to following a course of action on an issue about conduct or performance, the considerations below should be addressed. 1. Was the worker aware of the performance or conduct standards or the relevant workplace policy? 2. Was the performance or misconduct issue discussed with the worker as soon as it arose? 3. Was the worker given an opportunity to respond to the allegation of unacceptable conduct or poor performance? 4. Was the worker’s response considered before any disciplinary action was taken? 5. Was the worker given a reasonable opportunity to improve performance prior to disciplinary action being taken? 6. Was the worker given sufficient information to enable the worker to respond to the performance issue or allegation? 7. Was the worker given sufficient time to prepare a response? 8. Have all relevant witnesses been interviewed? 9. Have any issues raised by the worker in their defence/mitigation been properly explored/considered? 10. Is the performance or conduct issue sufficiently serious to justify termination or disciplinary action? 11. Does the hirer have sufficient and direct evidence to substantiate the worker’s failure to meet the performance or conduct standard? 12. Has the hirer acted consistently on other similar occasions involving other workers? 13. Has the worker had the opportunity to respond to both the reasons for the termination or disciplinary action, and to the decision as to the outcome? Payment methods: Credit cards and debit cards (Mastercard/ Visa). Supply of LMPL's industrial relations items - the Industrial Relations Consultation, the Fixed-term Industrial Relations Supply and the Enterprise Bargaining Supply - is initiated in our office, or by telephone or email as relevant, within 2 to 5 business days of purchase. Our digital downloads - MatarazzIR pro formas - are automatically available to download as digital files once payment is confirmed. Exceptions from our cancellation policy are: MatarazzIR digital downloads. If you purchase a digital file that is automatically available to you upon completion of the payment process, then cancellation and refund are not generally available. We require you to read and understand the MatarazzIR™ Product Disclosure Statement (in the additional information in this shop) before you purchase the MatarazzIR™ pro forma. If you purchase one of LMPL's industrial relations items - the Industrial Relations Consultation, the Fixed-term Industrial Relations Supply or the Enterprise Bargaining Supply - cancellation and refund are available before we initiate supply. We invite you to read the individual product descriptions in this shop, and contact us with any questions, before you purchase. We invite you to take a close look at the individual product descriptions in this shop. The pro forma contract for services has been designed for skilled independent contractors, to help them move into independent contractor work, where there is demand. Being able to satisfy work demand, when and where it occurs, is being prepared – as a skilled worker or as a hirer – and that starts with a valuation of the work. The pro forma contract for services helps workers and hirers describe, negotiate and agree the scope, conditions and terms of an independent contractor agreement – by setting forth the general information fields that can form a contract for services, ready to be customized by you. When you intend to make a contract for services, you should carefully consider the scope, conditions and terms that suit your needs including the level of obligation and the level of payment that you are willing and lawfully able to agree. Sometimes obligation is also known as liability. We recommend that you obtain legal advice before finalizing the MatarazzIR contract. This may be important if you do not know how to identify and assess the liabilities and risks that might apply to you under the terms of a contract for services. MatarazzIR is a pro forma contract that is designed to be customized by worker and hirer, to their mutually agreed needs, before it is signed. You must read through this Product Disclosure Statement carefully to help you understand what MatarazzIR does feature, what MatarazzIR does not feature, and what your responsibilities are. If you are unsure, or need further information, or just need to ask a few questions, please contact us, or your industrial relations advisor or legal advisor. Our contact details are located in our MatarazzIR shop at the Etsy marketplace: http://MatarazzIR.etsy.com . We are the exclusive seller of the MatarazzIR pro forma. This summary lists important provisions and features that are in the MatarazzIR pro forma contract, with an example of what is not covered by MatarazzIR in relation to the provision or feature. This is a summary only and there are other things MatarazzIR does not feature. For further details on what MatarazzIR does and does not feature, read this full Product Disclosure Statement carefully including exclusions and limits at paragraphs 12 to 18 of the Product Disclosure Statement. MatarazzIR makes room for signatures at the front of the contract. Why? – For easy reference to the parties’ names and contact details. But – Contracts usually have the signing page towards the back. MatarazzIR’s format is a valid point of difference from other contract forms. We recommend that you obtain legal advice, read, understand and agree with the full contract before signing. MatarazzIR provides terms that contain options relating to different needs of the parties. Why? – To motivate the parties to negotiate, value and agree their roles and objectives relative to the work. And because MatarazzIR is a pro forma document that does not take into account your specific circumstances. Caution – You are responsible for signing off on the option that applies to the parties’ agreed objectives (and deleting the options that do not apply). MatarazzIR places its Schedules at the front of the contract. Why? – For easy negotiation of the work and its value before making the contract; and then easy reference to the description of the work and performance standards. But – Contracts usually have Schedules at the back. MatarazzIR’s format is a valid point of difference from other contract forms. We recommend that you obtain legal advice, read, understand and agree with the full contract before signing. MatarazzIR states that the independent contractor is not an employee. Why is that necessary? – To remind the parties that the worker is responsible for managing his or her own tax, superannuation and insurance among other things. But – MatarazzIR does not cover the circumstances in which a hirer might have to make superannuation, workers compensation or payroll tax contributions. We recommend that you obtain legal advice about how and when these potential obligations apply to you. MatarazzIR provides a complete dispute resolution process. Why? – For handling of disputes (if any) between the parties, in good faith and economically. But – The dispute resolution process doesn’t override a lawful privilege of either party to sue the other without first following the dispute resolution process. MatarazzIR states that the independent contractor sets up a safety program. Why is that necessary? – To satisfy non-transferable health and safety obligations of the worker as he or she works and carries on business. But – The hirer has a mutual responsibility relative to the health and safety environment of the work. MatarazzIR is a contract for a specified period of time, which can be extended or terminated earlier in accordance with the terms of MatarazzIR. Why? – For easy response to the changing demands of work. But – You are responsible for customizing the Work Schedule, before making the contract, to cover tasks that are outcome-based. MatarazzIR provides terms that deal with Confidentiality, Intellectual Property, Moral Rights, and Conflict of Interest. But – MatarazzIR does not cover for example, restraint of trade. The MatarazzIR ethos is consistent to supply of product in a competitive fashion. MatarazzIR states that the hirer pays the independent contractor for satisfactory and timely performance and completion of work. Why is that necessary? – To establish a basis on which exchange is made: an amount of money proportionate to supply and quality of service. But – You are responsible for ensuring that the contract is not unfair. MatarazzIR provides terms that refer to requirements or processes contained in legislation of the Commonwealth of Australia (Cth). Why? – For easy reference to a model standard of practice or process. You can access the legislation at the Cth legislation website: www.legislation.gov.au . But – You are responsible for ensuring that legislation referenced in the contract has valid effect in your circumstances and in your land or jurisdiction. This summary lists some of the important information to consider when purchasing MatarazzIR. This is a summary only and there are other things you should be aware of when making the purchase. For more details, read the full Product Disclosure Statement carefully. MatarazzIR™ is a generic product (not a service). When you purchase the MatarazzIR pro forma, you purchase a thing that has not taken into account your objectives, industrial relations or legal situation, or needs. The pro forma is ready to be customized by you. If you have questions about the way the product functions, please contact us. MatarazzIR recommends that you seek independent legal advice that can check your customized contract before you sign it. This may be important if you do not know how to identify and assess the liabilities and risks that might apply to you under the terms of a contract for services. You can find these advisors in the business pages of your phone directory, commonly under ‘Attorneys,’ ‘Lawyers’ or ‘Solicitors;’ they charge their own fee for service. MatarazzIR™ is available in electronic format only. The MatarazzIR pro forma is supplied in .docx format to enable download and customization by you. We do not supply the product in hard copy. MatarazzIR™ can be purchased in the MatarazzIR™ shop in the Etsy marketplace only. MatarazzIR is only available for purchase in our MatarazzIR shop in the Etsy marketplace at http://MatarazzIR.etsy.com . We do not accept payment methods such as cash, cheque, or by telephone. When you pay, you will be sent receipt advice by way of Etsy. MatarazzIR™ is a digital download. MatarazzIR files will be available to download once payment is confirmed. MatarazzIR will be available to download by way of one email address per purchase. Be able to receive and safely retain MatarazzIR as available to download by way of the email address you provide at time of purchase. Arrange your own access to software programs that are fully compatible to the .docx MatarazzIR format available to download, in order to properly use the MatarazzIR file format. Customize MatarazzIR to suit the objectives and needs of the parties before making the contract. Be able to print your customized MatarazzIR, with no loss of formatting, before making the contract, to ensure you have the chance to double-check the contract before signing. We recommend that you seek independent legal advice in any event, including if you do not know how to identify and assess the liabilities and risks that might apply to you under the terms of the contract. MatarazzIR is not legal advice, is a general supply only, and has not taken into account your specific objectives, situation or needs. Please refer to clauses 5, 8, 9.1 and 11 of this Product Disclosure Statement. MatarazzIR is not suitable for work arrangements that unfairly seek to restrain trade of either party. We cannot guarantee that MatarazzIR is virus free or without defects. While MatarazzIR has been scanned for common computer viruses and found to be virus free, we recommend that you perform your own virus checking processes. You are authorized to share the MatarazzIR pro forma contract for services with your industrial relations or legal advisor for review and advice purposes. Consultation with an industrial relations or legal advisor is recommended before you sign the MatarazzIR. You may only make a copy of the MatarazzIR pro forma contract for services, and customized MatarazzIR, for distribution to the parties in direct connection to the contract. Any uses other than those set out in this paragraph are strictly prohibited. You are not permitted to use any trademarks, trade names, graphics or designs that are in the MatarazzIR pro forma or associated information. If you breach MatarazzIR’s trademarks then we reserve the right to take action against you. Under no circumstances is Lucio Matarazzo Pty Ltd and CJ Matarazzo trading as MatarazzIR (ABN 53 394 554 352) liable to any user or purchaser of MatarazzIR for any direct, indirect or consequential loss or damage (howsoever caused, including but not limited to negligence of or by Lucio Matarazzo Pty Ltd or CJ Matarazzo) sustained by that user or purchaser in connection with MatarazzIR. About the MatarazzIR™ document format. We supply MatarazzIR in .docx format because we believe the format is generally accessible to MatarazzIR users. We welcome feedback on this point. You are responsible for arranging your own access to software programs that are fully compatible to the .docx MatarazzIR format, in order to properly use the MatarazzIR file format. Before we upload MatarazzIR to a point of sale and or a point of dispatch, we scan its files for common computer viruses by way of our antivirus software. We only upload files if no threats are detected by way of the scan of the files. However, we cannot guarantee that MatarazzIR is virus free or without defects and we recommend that you perform your own virus checking processes. About legislation relevant to independent contractors. Our summary of MatarazzIR features at clause 8 of this Product Disclosure Statement refers to hirers’ and workers’ obligations that can apply in Australia. These obligations may not apply to work engagements that are governed by another country. However, we encourage hirers and workers to benchmark the scope, conditions and terms of their MatarazzIR Independent Contractor Agreement alongside Australian obligations, while they take into account their local law, objectives, situation and needs. Notwithstanding clauses 2.1 and 2.2 of the MatarazzIR pro forma contract for services, the fact that MatarazzIR uses the term ‘Independent Contractor’ does not necessarily mean that it is a correct term at law in the relevant jurisdiction. For example, an ‘Independent Contractor’ as described in MatarazzIR may, in some jurisdictions, be an employee at law and not an independent contractor. We recommend that the legal advice, which you’re recommended to obtain before finalizing the MatarazzIR contract, advises you about this issue. The Australian Consumer Law applies to you and us if you purchase MatarazzIR for a work engagement governed by Australian law. If you are not satisfied with supply to you of MatarazzIR, you can complain to your Australian Consumer Law (ACL) regulator. Further details are available on the ACL website at www.consumerlaw.gov.au . We are happy to address your dissatisfaction beforehand and ask you to submit your complaint to us at our contact details in our MatarazzIR shop in the Etsy marketplace at http://MatarazzIR.etsy.com . COLLECTION. The Company may collect personal information about you either directly, or through an entity with whom it engages in accordance with your consent, for the purpose of delivering the services provided by the Company as described in its Quality Management System. The Company’s services include: interpretation and drafting (includes instrument review and amendment); workplace investigations; risk management; industrial advocacy; and enterprise agreements. You may request a copy of the Company’s Quality Management System by contacting the Company as detailed under Further Information below. The Company also collects your personal information to enable it, and the entities with whom it engages in accordance with your consent, to provide you with information that is relevant to the services it provides and your area of interest. The types of information that may be collected by the Company for the purposes described above include: your name; your contact details; your standing in relation to an industrial, workplace or compliance matter; and other information or opinion about you, whether true or not, that is relevant to the service delivered by the Company. DATA QUALITY. The Company will make all reasonable efforts to ensure that the personal information it collects and uses and discloses is accurate and complete and up to date. DATA SECURITY. The Company has appropriate security measures in place to protect personal information from misuse, interference or loss and from unauthorised access, modification or disclosure. ACCESS and CORRECTION. You may request access to your personal information held by the Company by contacting the company as detailed under Further Information below. The Company may decline to provide you with access to your personal information where it is permitted to do so under the Privacy Act. The Company may impose a charge for providing you with access to your personal information. You will be notified of any such charge at the time of making a request for access to your personal information. If you notify the Company that personal information it holds is not accurate, complete or up to date, then the Company will take action to correct the information. Street: 10 Stokes Street, Parap, NT 0820 Australia. Mail: PO Box 2116, Parap NT 0804 Australia.